J. Todd Matthews helped pioneer dead body identification in America. And 30 years after learning about "Some Mother's Boy," he's nearly confirmed who it is. When he drove into the cemetery in Georgetown, Kentucky last March, J. Todd Matthews was thinking about a dead man best known as "Some Mother's Boy." The three words were written on a grave 96 years ago in place of a name, marking the spot where a 19-year-old was buried after being struck and killed by a train. Matthews has thought a lot about the man in that grave over the past three decades. Now 47, Matthews was just 17 when he first visited the "Some Mother's Boy" gravesite. He'd read about the mysterious death in a Master Detective magazine issue that also told of another unsolved death: the "tent girl." That was the nickname given to Barbara Ann Hackman Taylor for the canvas material in which her body was found wrapped in 1968. Matthews's interest in unsolved deaths continued into adulthood, and 19 years ago, he leveraged the (relatively) early Internet to identify Hackmann Taylor, even though he had no formal law enforcement or forensics training. Since then, Matthews has gone from working in an automotive supplies factory to a career in cold-case body identification, helping create NamUs, the federal online database that connects records of unidentified bodies with missing person reports around America. By its own count, as of May 25, NamUs had helped identify 1,092 previously unidentified people and helped find 1,660 missing people—with some overlap—since its creation in 2007. But despite all of Matthews's professional triumphs over the years, "Some Mother's Boy" still has no official name. With the National Institute of Justice's recent announcement that federal grant funding for missing person DNA testing will not be offered this year, Matthews recommitted himself to the mystery of the strange grave in Georgetown. According to him, the Federal Bureau of Investigation is still accepting samples for testing on a case-by-case basis, and agreed to run DNA testing on the remains of "Some Mother's Boy"—if family members could be found to compare the samples to. On Friday, March 10, Matthews, along with Scott County Coroner John Goble, Fayette County Coroner Gary Ginn, staff from both offices and the Kentucky State Police went to the cemetery about a mile south of Georgetown with a backhoe and shovels. There, they dug up the the century-old grave Matthews is obsessed with. "People have questioned why we are doing this after 96 years, but I see this as a chance to see how far we can go with forensic science and modern cold-case investigation," Matthews, whose current title is director of communications and case management for NamUs, told me. "If we can connect a body with an identity after so many years, then we can give people hope, even after 20 years and longer. I think if it was our missing relative, a vast majority of us would want that closure." What we do know about "Some Mother's Boy" is confined largely to the train that killed him. On the night of April 1, 1921, two men were crossing train tracks in Georgetown just as the Royal Palm luxury liner was heading north through the town. One man made it across safely, but the second man was struck by the train engine and died in a nearby hospital the following morning, according to a 1921 newspaper story from the Georgetown Times. The man who survived immediately bought a train ticket for Somerset, Kentucky, about 90 miles south of Georgetown. Local police caught up with him there, but he said he didn't know the man who was killed, and that they just met on a train near Cincinnati. The dead man was described as five feet six inches tall, weighing about 110 pounds, blue eyes, brown hair and fair complexion, according to the newspaper. His clothes had tags from H.M. Lindenthal & Sons out of Chicago. There was a laundry mark on his clothes with the name "Jones," the letters "W.A." engraved on the back of his watch and "L.H.D." inside the timepiece. 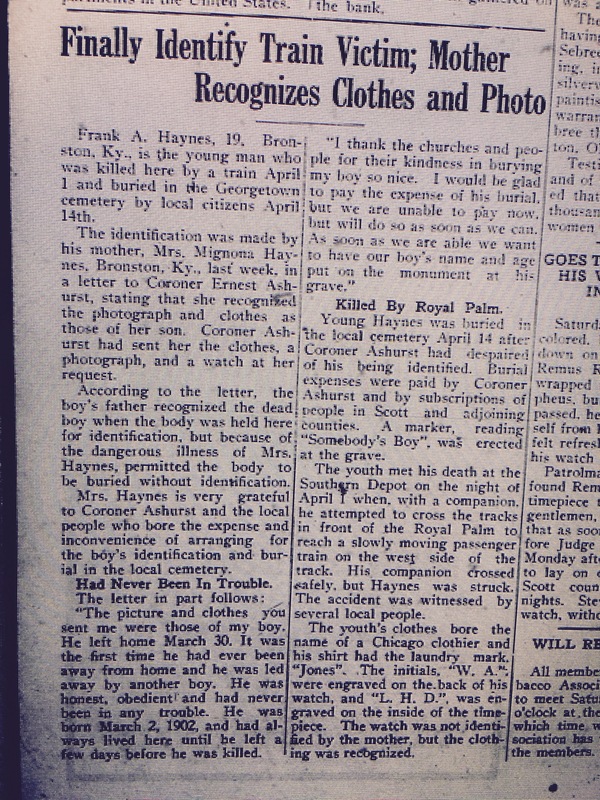 The paper identified the body in 1921 as that of Frank Haynes of Bronston, Kentucky, attributing the name to the coroner and a letter written by the mother. But no official death certificate was made, and no clear reason given for why his name wasn't put on the grave. Brief notices from August 1921 in the Cincinnati Enquirer and Richmond Daily Register likewise suggest that then-Scott County Coroner Ernest Ashurst announced the body belonged to Haynes. The Enquirer included a middle initial "A" with the name. Still, uncertainty remained. "Frank's father had reportedly seen and recognized photos of the dead boy during those first two weeks when the coroner was attempting to identify him, but the father apparently allowed him to be buried without identification," read one press release from Matthews and Goble, the Scott County coroner. "The coroner followed-up with this lead and sent a photo of the clothing and the watch to Mrs. Haynes. In mid-August of 1921 she sent a letter back to Coroner Ashurst telling him that she recognized the boy's clothing but not his watch." After about two weeks, local residents in Georgetown donated money to cover the burial, and the grave was marked with the vague head stone that remains to this day, according to the Georgetown Times. It wasn't until this March that bone fragments and teeth belonging to the man were dug up and sent for DNA analysis for the first time. "The bottom line is we have the available techniques and technology to solve this case and we have a responsibility to try," Goble said. "If it was your uncle, cousin, parent or even close friend, wouldn't you want the same?" 50-year-old Rick Haynes of Somerset, Kentucky, grew up hearing stories about his uncle Frank Albert Haynes, who died in 1921, two years before his own father was born. Uncle Frank, who Rick was told was killed by a train north of Somerset, was one of 12 kids. The family couldn't recover the remains. "Travel was challenging for the family with as many young children to look after, from what I was told," Haynes recounted to me. Haynes, fire chief for the volunteer Dabney Fire Department that covers parts of rural Kentucky northwest of Somerset, was driving from his area to Frankfort when he was told that the body of Frank Albert Haynes might have been found, shortly after a story was published in the Commonwealth Journal about the case. "I did hear about the body being exhumed of a young man killed by a train, but as a kid I didn't know anything about Georgetown," Rick Haynes said. After learning of the possible connection, he headed to Georgetown to talk to Goble and Matthews. "I can tell you from 30 years in emergency service that DNA and forensic investigation is deeply important even for old cases," Haynes said. "Not only can it bring closure, but it could overturn wrongful convictions. Older cases might not take priority over crimes that are more recent and more pressing, but the techniques can be further honed with this case and maybe my uncle could help with that." Members of the Haynes family agreed to participate with the DNA testing. Since announcing the exhumation in March, Goble and Matthews learned of another Kentucky man fitting the description who disappeared around the same time. Owen Bennett Wheeler, Jr. of Trimble County had gone missing after a fight with his uncle, whom he was living with in 1921, according to a distant relative. While awaiting DNA testing, reportedly due next month, the investigation will continue to solicit more evidence that the remains belong to either Haynes or Wheeler. "Ultimately we want to give the remains back to the family for a proper burial," Matthews said. "In the meantime, we will keep looking for other evidence that supports identifying this man. Forensic science isn't just blood and teeth. At some point a mistake was made in recording this man's death, and we aim to correct it." Anyone with any additional information on Frank A. Haynes or Owen Bennett Wheeler, Jr. should contact Scott County Coroner John Goble at (502) 570-0525 or Todd Matthews with NamUs (817) 408-6723. Follow Ben Feldheim on Twitter.